Matt Kittle had a vendetta last year against a Germantown Kindergarten teacher,who had a few beers at a county fair and ripped up a Republican yard sign. Kittle felt that a teacher on summer break, ripping a yard sign, was unpardonable and he made it his goal to get her fired,. Now as Capper and I both pointed out yesterday, Scott Walker, encouraged and condoned an attack on a protester at the Iowa State Fair. Not a single word from Kittle, condemning this action by the Walker goons or Scott Walker himself. I thought that he would for sure be calling at least for the outing and firing of the two thugs who grabbed the peaceful protester if not Scott Walker himself for goading on his goons to take care of his problem. Apparently Violence against people who disagree with you is acceptable and encouraged. PS: Dave Blaska, who left this comment, also has been mum on this incident. Was that a public servant? do all men of color wear grills, or is blaska just another knuckle dragging racist white boy? April Kay Smith paid her fine for a misdemeanor charge of disorderly conduct. Blaska, are you saying that because she was a teacher, she should be fired from her job? As for the protester, by what right can the Walker supporters destroy his sign and restrain him physically? With what should they be charged? It was legal to be a brownshirt in Nazi Germany and beat up on those who opposed the regime. Hmmm... does Dave support that type of behavior and what does it say about modern conservatism using brownshirts to harass opponents? Is this the same Kittle who writes for Wisconsin Watchdog? Ive read enough of his crap to not be surprised. Gee Dave ... are you a public servant? Is Walker? Well, I know both of them are pulling in big bucks from the taxpayer- Scotty yis still taking his full $144K as guv, and WHAAAA-ska is a triple-dipper pensioner. 21st Century GOP motto- "Our rules don't apply to us." I didn't see Walker ripping up any signs. And no, I am not a public servant. Ah Dave but you were and collecting a state pension. BTW have you giving up collecting that pension in the name conservative purity? Maybe if Dave would put down the tea-flavored Kool Aid, he'd see Walker ripping the sign right out of the guys hand. Then again, Dave was probably cheering on the goons physically assaulting the guy. But the righty's like Blaska have no room for actual proof or evidence. Watch the video, read the news accounts. Scott Walker did not tear up any signs. And where did you get the idea Tomscrotum, that conservatives were opposed to pensions. Walker merely required state employees to resume paying the employee share, state finances being in the hole after 8 years of Jim Doyle. He didn't tear it up he ripped it from his hands. If someone had done that to him they would be arrested. yes the problem is now we are paying more a safari finances are even more In the hole. clearly, you can see walker’s little friends grabbing at the sign while assaulting the guy with the sign. that’s were concealed carry weapons and a "stand your ground law" becomes the liberal’s friend. SKWs friends should been capped for their assaultive behaviors, and walker charged with receiving stolen property. It would have been totally legit. Simpson and Capper are worried sick about a shredded sign but their friend Sarge says Walker's supporters "should have been capped." Pretty much sums it up. Haters got to hate. The full video is in my blog and if you look at the picture above....he clearly has the sign in his hand. I know we should pretend he doesn't because he walks on water to the righties here. No, Jeff. 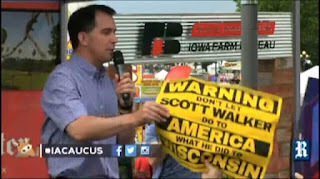 Capper at Aug 19 at 9:44 PM says "Walker [is] ripping the sign right out of the guys hand." At 11:22 PM you chime in "The picture above shows what Capper is saying, Scott Walker stealing someone elses property." At Aug 20 at 10:17 AM you write "He [Walker] didn't tear it up he ripped it from his hands." He did no such thing. You made the allegation. Now retract it. Like everything else I write here it is the truth. The picture above clearly shows that walker has it in his hands. I doubt the protester gave it t him because they are good friends. He briefly touched it as it was thrust up into his personal space but never pulled on it and certainly didn't rip it. "Like everything else I write here ..." Now THAT is for sure! I don’t know Blaska..is it hate, or a simply a tendency among the good Americans, to be dismayed by naked fascism? why do you support this kind of thing? what broke inside of you, or where you born this way? What the hell would your dad think if he knew you were shitting all over the chief accomplishment of the “Greatest Generation’? Facts are too hard for Blaska. Looks like Walker does not believe in freedom of speech. Actually the teachers union deferred raises for years to maintain their benefits...all negotiated in good faith with both parties when in power. It was Scott Walker who "dropped the bomb." Anyway, another conserviative lie from the morally challenged. At least we're not Walkering around with our heads up our asses, Dave.